On the plus side, they probably can’t do any worse than that..
A word of advice, call dpd for the local tracking number once it arrives in Oz. My Fastway delivery driver never bothered ring the bell or leave a card behind and dropped it at the parcel collection point, ended up sitting there for 2 weeks! Mine was posted yesterday. Need it to arrive before Friday next week as we are away for 3 weeks from then. Will contact DPD for a local tracking number. A got a notification from DPD that my parcel was being sent, but when I click the tracking link it says it was cancelled by Niche. Will give it until opening UK Friday to see if it updates. Pretty fast delivery, it’s waiting at a local convenience store and I’ll pick it up this evening. Woohoo. simonsk8r, noonar and level3ninja like this. I love that the stainless grounds cup fits into a 58mm basket. Easy to transfer the grounds to the filter. Need to play around. 15.5 seems about right. Had a nice americano at 50 seconds for 30ml out with 7 sec pre infusion. Dimal, matth3wh, simonsk8r and 2 others like this. How did you manage to arrange a pickup at the convenience store? Sounds like a good approach. Fastway tried to deliver when no one was home. From there all the packages go to a local convenience store who contacts people to collect. Works well, would have been a pain to have to go to Homebush to their official depot. matth3wh and topshot like this. Arrived this morning! Impressive delivery experience. Shipped: 9th, cleared customs: 12th, delivered 15th. Re the Niche itself - very impressive, small, quiet and simple to use. I did first shot set to 14 and choked my machine with the shot. Turns out the calibration was off by a bit. After calibration next shot at 14 was pretty much perfect. Definitely much stronger flavours come through with the Niche grinder. BTW. Niche have updated the markings on the grinder. The “Coarse, Fine” labels have been swapped with the “Espresso, Filter Drip” labels and the setting mark is what looks like a small stainless ball bearing. Very nice. The instructions still say to use the white mark I think to recalibrate. Was pretty obvious it must be the ball bearing. I was able to get a nice 30ml pour in 45 seconds or so with a 7 second pre infusion. Wishing I had a naked portafilter so I could see how evenly the liquid is espressed (just made up a word I think). We’re traveling until early February, wishing I had at least a hand grinder for pour over. Japan struggles a bit for what we in Australia would consider a decent cup. That said I had a totally decent soy flat white at an Excelsior cafe yesterday, beans were super dark. Their black coffee was fine too, not bitter, however no origin flavour at all. Was hoping to have time to visit this coffee shop I saw a video made of on YouTube. Older gentleman who’s been roasting for 40 years, pour over. No time this time though unfortunately. Try some Drip-on coffee filters while you are in Japan. They are very Japanese - like a little origami to fold out and sit on your cup. You can get them at most department store food halls in packs of about 10. I get a decent pour over from them when I want a coffee in the hotel room. I took delivery of my niche last week and finally got to use it on the weekend. I haven't used any grinder other than my breville before and I have to say the difference was amazing. The thing is build like a tank. It ripped through the beans without the burrs slowing down or deviating even a millimetre. The I put in 21.8 grams of recently roasted beans from Dukes, the grounds came out fluffy, consistent and completely clump free and weighed in at 21.6g! But what really killed it was the flavour of the coffee I was able to pull immediately. Don't know if it was dumb luck but with grams I got a pretty even, 35 second extraction through my naked portafilter and a sweeter cup than I've ever produced from my Silvia and Breville combo. I knew on an intellectual level that the quality of the grinder and hence the grounds had one of the strongest effects on the quality of the extraction but deep inside I always suspected coffee snobs have a tendency to overthink things and exaggerate marginal differences.. I really didn't believe it could make such a massive difference in flavour. Can't wait to do some more experimentation to really dial it in and perfect my workflow. Dimal, noonar and level3ninja like this. Most annoyingly though, my adjustment collar slips about 1/2 a setting each morning after grinding 2x16g shots. After cleaning the threads per Niche's suggestion the adjustment moves far less. I'd say it wanders 1/2 setting in 3 shots. Last edited by Altiplano; 30th January 2019 at 01:46 PM. After a decent play with the Niche, it's been a mixed bag for me. I take it you've dble checked, rechecked the locking mechanism ( no ive never seen one n the flesh, nor used a Niche) cleaned and refitted the adjustment collar. So it is backing off under grind load? Any one else with a Niche with this behaviour? Nope, no collar slipping here. I'd say it wanders 1/2 setting in 3 shots. No to each of those, no sign at all. I agree with your other comments, by the way. I also like the fact that I can switch it on then stroll off to the frig to get milk or whatever rather than having to hover over it or hold anything. Yup - usability on this unit is great. I see the utility in having something to indicate to a user that the finger chomper is on, but given the safety lock out on the lid I don't think it's strictly necessary. - That way, I could leave all my powered appliances on and ready to go. A tiny piece of masking tape?, opaque nail varnish?, modelers enamel paint?... should block most of the light, which is dull on mine anyway. I use red Litho tape (... a remnant from the past) over any standby lights that tend to catch the eye. So far communication with Niche has been amazing. I got a reply within 30 mins (good timing!) of my initial email. Sent them a video showing the collar movement. Ran through a couple of suggestions which improved the issue. This reduced movement significantly. However, Niche are sending new springs to totally eliminate the movement. It's rare to get such quick responses and action. Puts many reputable companies to shame. Dimal, simulacrum, topshot and 4 others like this. I’m loving mine. Received it a few days before a 3 week holiday. Have been using all this week, and am really happy with the grind quality and the control over how fine the grind is. I love the dosing cup too which fits into the portafilter. Coming from a hand grinder, the Niche is making my coffee workflow so much more efficient and enjoyable. I’d like to get a naked portafilter for the bes900 so I can see how the evenly the coffee is saturating to ensure I’m getting an even extraction. A quick question to anyone who has bought the Niche recently... What was the final price you paid? I can see the Indigogo page says $910 AUD for the grinder but as it sold out I can't add to cart to estimate shipping. Also did you pay GST when it arrived in Oz? Mine was £50 shipping so £549 all up - back in December but probably hasn't changed. Were you hit with GST as well? Just trying to weigh up this versus the $730 Mahlkonig Vario. If I have to pay GST then final price is right on $1100 which pushes it out of my price range. I wasn’t hit up for gst. I paid $970 all in. If you’re paying $730 for a Vario, may as we’ll stump up the extra for a Niche in my opinion, it should be a better grinder and good for single dosing. I’m seriously considering this grinder for single dosing. Apart from the single dosing component, does anyone know if there would be improvements/differences in the cup over a Macap M4D? I received mine mid December 2018 and final cost in $AUD delivered was just under 1K. Was not slugged with GST. I’ve come from a M4D to the Niche, I could go on about apple, blueberries, fruitcake blah blah. But it would all be BS, I haven’t tried training myself/palate to recognise all the nuances of coffee. But truthfully flavours do seem more intense/enjoyable without bitterness. Must state I do not generally do espresso, I should give it a shot, I may actually enjoy them now. Dimal, Hoggers, beensean and 1 others like this. This is my dilemma - do I pay 33% more to achieve that 5-10% better coffee with the convenience of single dosing or compromise a bit for a good grinder that gets me 90% there? As a cycling fanatic I've tended to go for the sweet spot of value/performance with my bikes and not regretted it yet. So I'm leaning towards the value oriented Vario (head) over the oh-so alluring Niche (heart). There is A LOT more value in the NICHE on all counts when compared directly to the Vario of which I've owned and dismantled a few. Niche is a solid piece of kit period. It's a strange way of looking at things. You pay 33% more once and then get a 10% improvement in coffee permanently. Bit of a no brainer if you're a serious coffee drinker. Mono and DamianB like this. Most of us need to budget an amount to work with, sensible people work within these constraints, 33% above is considerably over budget. 5 to 10% improvement! I doubt it, the mind does funny things when we've just stumped up a substantial amount of cash for a new toy. This grinder is flavour of the month right now, a while down the track there will be another offering that everyone is raving about, they come and they go. Plenty of grinders around within the price range that will do an excellent job, they've simply become old hat among the trendy set. Even the humble Rocky doserless does a very good job once you have taken the time to learn how to use it. Dimal and chippy like this. I’m a bang for buck guy too, tending to buy the best value I can. For me the Niche was the only option. No retention, commercial burrset, single dosing. I don’t waste any beans now, it’s a great little device. I have a feeling a Vario or Sette would have left me looking for a grinder upgrade in a few years. I don’t see myself needing to upgrade grinders again with the Niche. Dimal, justacuppa and Mono like this. No retention, commercial burrset, single dosing. I don’t waste any beans now, it’s a great little device. 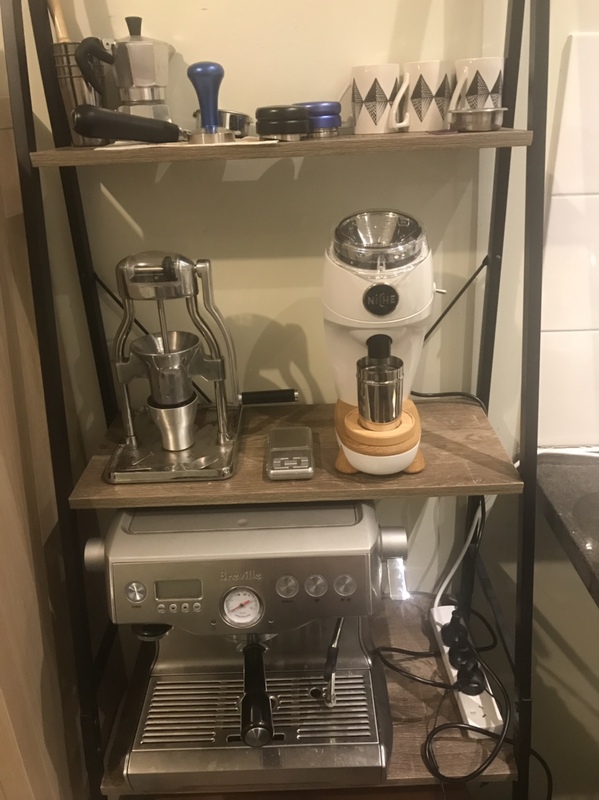 With a little thought most grinders can be set up to operate in this manner, my Mazzer mini certainly meets the criteria, it's almost 10 years old and going strong. It's only a couple of years ago that Compak and Macap grinders were the bee's knees, we seldom see any of these three brand names come up for sale second hand which must tell us something. Not knocking the Niche, I'm sure is a very capable little device, I just don't believe it's the holy grail of coffee grinders. Dimal, chippy and Hoggers like this. Out of the box the Niche does exactly as it is described. I own a Mini e and a Niche, the Mazzer is nowhere near as "fit for purpose" as the Niche is in single dosing terms (in my experience YMMV). I would not (and have not) go back to the mini e unless I had a breakdown with the Niche. I invested in both grinders so I have no financially influenced opinions on either, in fact if I was that clever I would be bragging up the Mini e in order to enhance my potential financial return on resale - simply about getting a consistent good single dosed grind to my palate simply and efficiently, the less fuss the better. I am not knocking the Mini e but it is not a Holy Grail, neither is the Niche or any other grinder for that matter. justacuppa, Hoggers and beensean like this. I can not see anyone saying its the holy grail of grinders? it's definitely not. But as per usual you seem to feel the need to comment on something / everything you know SFA about / have no direct experience with. Your comparisons to small flat burr grinders with high RPM for single dosing are in no way relevant to this thread. Seems I hit a nerve there Steve suggest you stick to the subject at hand and not attack the poster. What I'm saying is there are plenty of easy to use grinders on the Aust market that are more than capable of producing an excellent brew. I have nothing against early adopters, however in my opinion it's safer as well as being far easier on the pocket to stick with tried and proven technology. Dimal and Hoggers like this. Just my 2 cents as a Niche user. The main reason I bought the Niche is because I go through different beans throughout the day, up to 3-4 different types, the normal beans don't differ too much but once you get to decaf it requires quite a few notch finer. I've found no need to purge the grinder between different beans and the adjustment is super quick. I was using a compak k3 before and it was a nightmare to change between beans, in the end I just left it on one setting and dealt with an under-extracted decaf. I can't comment on the vario regarding bean change but base on the comments from different forums, it seems to require some purging especially between different brew methods. I've done pour over then back to espresso with the niche and found that purging wasn't required. I would say get the grinder to suits your workflow, for me that is the Niche. If your concern is about the durability maybe buy from a site sponsor, I'm sure they'll be able to help you out if something goes wrong down the road. Dimal, justacuppa, simulacrum and 4 others like this. I hear where your coming from Benny. I'm not sure why you think the Niche doesn't contain tried and proven technology? Surely DC motors, Kony burrs and polished metal are things that have been around for a long time. One of the big advantages for me is that the Niche doesn't contain any none tried and tested parts and none of the few things that are proprietary are electronics that are likely to break at some point. Even the way it switches on and off is a simple off the peg toggle switch, that as well as being much more sturdy, can be picked up at just about any electronics store. There's two within walking distance of me and I'd be surprised if they don't both stock it. You mention the Rocky as an alternative. That is a small, stepped, flat burr grinder with loads of retention, that is quite noisy in operation and has a much higher RPM, so about as far away from a Niche as you could get without suggesting a hand grinder ( which would have been a better call ). It's build is fine, but there's a reason it doesn't get much of a mention these days and that's because there's better alternatives out there at every price point, not because it's no longer flavour of the month. I don't want to come across as patronising, but have you ever actually used a Niche grinder? Saying that you doubt it will give a 10% improvement over a Vario is a bold statement to make if you're just going off pictures and other peoples opinions. I've owned both and the Vario is a cheapish grinder that is built to that cheap price with a lot of plastic and small burrs. The Niche has a rock solid build quality being made of aluminium, uses commercial, food grade burrs and doesn't have a track record of using it's customers as beta testers like Baratza does. There's over a thousand of these out in the wild now and the return rate probably less than 0.5%. The first thousand Sette out of the door probably had a return rate of about 20%. Last edited by coldwarkid; 13th February 2019 at 12:08 PM. noonar and Erimus like this. I've offered an opinion which may or may not be of use to people contemplating a grinder purchase, they can choose to disregard my comments if they so choose, no skin off my nose. I'm not in the least bit interested in becoming involved in a stand up knock down debate. I've owned both and the Vario is a cheapish grinder that is built to that cheap price with a lot of plastic and small burrs. The Niche has a rock solid build quality being made of aluminium, uses commercial, food grade burrs and doesn't have a track record of using it's customers as beta testers like Baratza does. There's over a thousand of these out in the wild now and the return rate probably less than 0.5%. The first thousand Sette out of the door probably had a return rate of about 20%. If you're talking about the Baratza Vario, it's not available in Australia other than as a grey import. And it's not even close to being in the same league as the current Mahlkoenig Vario available in Australia. Might be good to specify which Vario you mean. I am curious about this: my Mahlkonig Vario is clearly labelled "Assembled in Switzerland MK AU" while the Baratza website says that their Vario is assembled in Taiwan. They look very similar, are there any substantive design differences or are they the same design assembled in two different places? Apologies for the thread drift. Last edited by Lyrebird; 13th February 2019 at 12:15 PM. In the UK the Mahlkoenig Vario is the same as the USA version Baratza Vario other than the electrics for the mains supply. If the the Aus version is different then I can't comment on that as I have no experience and stand corrected. Does it have bigger burrs and a metal body in Aus then? That and the fact that customer service is pitiful in the UK are the main drawbacks over here. I can well believe that even if they are in essence the same machine, the tolerances that they are made to and QC could be different in the two countries, but that's a sweeping generalisation. I'm sure others know better. Sorry, like I said, I didn't mean to come across as patronising and I'm not looking for a stand up knock down debate ( I'm not even sure I know what that means ). I merely disagreed with your comments. There's plenty of other threads about the Baratza / Mahlkoenig Vario differences. Basically the Baratza is the same as a generation 1 Mahlkoenig, whereas the 2nd and 3rd gen Mahlkoenig have the guts of a larger Swiss cousin but still the same plastic body. Might best to leave this thread for the Niche. If you’re so inclined I’d be genuinely interested to understand how you single dose the mini Mazzer. Might be best in a new thread. Not wanting to start a religious war this is purely for my enlightenment. Happy to do so SanderP, keep an eye out for a new thread. noonar and SanderP like this.